Christmas is over and its that time of year, when everyone has eaten way to many Quality streets and roast potatoes and the discussion of new years resolutions has begun. “This year I plan on eating healthily”… “This year I will stop smoking” You know what I’m on about, the usual New year’s resolutions we give up by February the 1st. Anyway, I hope you all had a very merry Christmas and I wish you good luck in the new year. In this blog post, I will be discussing Identity and whether social networking is redefining it. So, when thinking about identity it’s basically the premise of being who you are. In Psychology, identity is defined as the qualities, beliefs personality, looks/and or expressions that make a person. Philosophers have discussed the issue of identity through the “Synchronic Problem of Identity” which examines ideas on what makes you the person you are today and not the person you were 5 years ago. Can it all be explained through space and time? As we seem to only occupy one place at one time in your life (Simply Zesty, 2012). I think my generation was the first generation to start documenting their whole lives on facebook. It’s really funny because I get to look back at my 11 year old self, taking photos in H&M changing rooms with frizzy hair and a Justin Bieber t-shirt. My whole life is pretty much online: getting into uni, taking my gap yah, getting my GCSES, my current relationship status. You really could find out a lot about me through my facebook profile alone. Though yet at the same time, there’s so much I have chosen not to display. I wonder if in 20 years, Facebook will still be a thing and I’ll be able to look back so far and look at the person I am today. What exactly makes us who we are? A question to be explored through social networking. Social media has “afforded us a unique opportunity to build a very visible, permanent record of ourselves albeit through a digital medium” (Lindley, 2013) We are provided with tools that allow us (re)create our own identities. So who are you on facebook? Does your profile accurately present who you are? What about LinkedIn? Or Instagram? Twitter? Hmm, what about your medical records or cloud locker? Where does our identity leave our passport or form of identification? It seems that often our identities vary because of platforms or really instead of having one single identity, people have overlapping identities which play different roles- be it social, legal or professional. This makes sense though doesn’t it, my LinkedIn profile is a lot different to my personal twitter (which I keep on private by the way), now this isn’t because I am an outrageous being who tweets about her utmost rebellious antics. It’s just that I do not want a prospective manager reading my post-night-out hangover moans or a 12 tweet story on why I hate Ellie Goulding, like imagine- Ellie Goulding is their second cousin twice removed or something. The key driver for this change is technology. Moreover, it’s the ability to be connected and in-the-loop at all times. Now in 2007, only 17% of the UK’s internet users were members of a social network but this has risen to a whopping 60%. This rise and the continuous proliferation of devices and virtually unlimited storage capacity allows pretty much everyone and anyone to document every aspect of their lives. This means we have a huge amount of personal data being distributed across multiple mediums and platforms which are open to big companies, advertisers, criminals and the government who often mine them and use them for their own benefit. Professor Sir John Beddington (2013) released a report titled “The future of Identity”, he discusses the impact social networking has on our identity and examines how technology is now altering our construction of personal identities. His report titled “The future of Identity” redefines ‘hyper-connectivity’ -near continuous access to the internet. Essentially Sir Beddington highlights that the use of technology and hyper-connectivity has a profound effect on how people find their place in the world and define themselves. In a BBC report they explained that Hyper-connectivity and the changing nature of identities will have serious implications for what is meant by communities and by social integration, the article also tells us that Beddington’s study shows that the traditional elements that shape a persons identity such as ethnicity, job, age or religion are less important than once thought. Our identities, especially in young people are starting to solely be understood by the way we immerse ourselves in online interaction and online role playing games. The report finds that the use of smartphones is drastically changing the way in which we communicate with each other, and the way we relate to one another may lead to place- based communities becoming less cohesive. In other words ‘hyper-connectivity’ has the potential to enable greater connectivity amongst a range of people and groups, essentially making it much more simple for groups to organise themselves quickly. The telegraph has also talked about ‘hyper-connectivity’ using Beddington report. The telegraph (2013) is of the belief that ‘hyper-connectivity’ and the rise of social networking will “fuel social unrest”. A well-known example is The 2011 London riots, the use of social networking within the unrest has been ably documented and we know that Social media and Blackberry messenger were communication platforms that were able to facilitate the social disturbance. Though ‘hyper- connectivity’ can help or aid social unrest, it is, of course, inaccurate to place all the blame upon it. The developments in technology are not responsible for the actions or the motivation of the choices those young adults made when deciding to loot and riot. ‘Hyper-connectivity’ provided the platform for communication but why should technology be the fuel that entirely fed the flame. Jonothan Rowson in his blog post on connectivity informs us that connectivity comes at a cost, undermining deeper connections that are all too easy to take for granted. The perpetual presence of our smartphones must be affecting our patterns of attention, whether we are aware of it or not- there’s this sense of “information addiction”. We are addicted to receiving new information, you know that kick we get from scrolling through IG, checking the twitter feed or hearing the pop up of an email it is all unrivalled to face to face interactions. 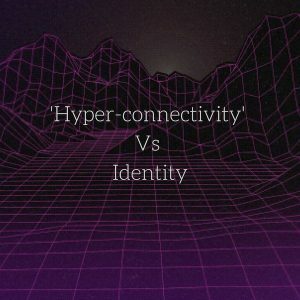 Referring back to Beddington’s report, the discussion of ‘hyper-connectivity’ and identity suggests that in the future someone who doesn’t have an online identity will be deemed as weird, unusual or suspicious. This represents the fading boundary between our online and offline identity. ‘Hyper-connectivity’ may be damaging but “who is held responsible when it comes to putting in preventative or protective measures in place?” (Emma Lindley, 2013) Is ‘hyper-connectivity’ just our way of life now and something we just have to accept? Are we already in some sort of collective denial about the potential impact “hyper-connectivity” has on our already very techno based lifestyle. Are we sleep walking into a hyper-connected future?